One kilometer east of the Bologna station the Eurostar City train (a regular, not-so-fast locomotive pulling cars redecorated inside to look like the usually speedy Eurostar line), traveling from Bari (in the Achilles tendon of Italy) to Milan, slowed to a crawl. Those planning to get off in Bologna were already standing, suitcases at the ready, in the aisles to quickly debark. The train stopped, the lights went out, the air conditioning quit, and the emergency lights came on. The station was not in sight. Two minutes passed and so did the well-lit Alta Velocità train (Italy’s fastest) with small LED panels on each door informing the City train passengers that its route was from Rome to Milan. The intercom system squawked static. “Cosa?” “Eh?” “Che dice?” echoed around the packed car. The sharp of hearing answered, “Questo treno è guasto.” Guasto – a great word – sounds as broken as its meaning. Not delayed. Not waiting for some other train to clear the station. Broken. After six hours of steady forward motion, the Bari to Milan train had stopped, broken, with five dark tracks on one side and four on the other. The debarkers turned as one, wheeling luggage back to their reserved seats, ejecting those who had thought to improve their positions for the last two hours to Milan. The lights flashed on along with air rushing through the ventilation system. Two minutes later both died again. The speakers barked out another message with the words “trenta minuti” repeated twice. Thirty minutes. Groans. Cell phones flipped open. Three ganzo guys, dressed alla moda, with big laptops on which for the past three hours featured interactive calcio games and a film with Cameron Diaz dubbed in Italian, cracked jokes about “senza benzina.” Another said this was like the Alitalia airline running out of gas. A frizzy-haired businesswoman from Milan popped in another fragrant wad of green apple bubblegum and resumed reading the wisdom of Eckhart Tolle in the dim light. Thirty minutes passed. Those going to Florence watched their train (the last connection scheduled for the night) zip past going the opposite direction. The air was growing warm and humid. Someone started to smoke a forbidden cigarette in the foyer outside the toilette. A man chewed on a panino con mortadella. A bologna sandwich outside of Bologna – there was a strange sort of symmetry. Exactly one hour after the Eurostar City sputtered to a stop, it started to back up and then crept forward. The lights came on and stale air blew through the car. “Come l’Italia,” said one person. Another responded that to be truly Italy the train would have broken down for three hours in a tunnel with no lights or air conditioning, as had been reported just the month before in the newspapers. The Bari-Milan Eurostar City pulled into the Bologna Central Station. The loudspeaker cackled. The Milanese lady swore and others groaned. This train was going no further. Everyone off. The Milan-bound passengers were directed to another platform. 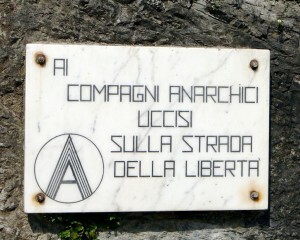 All others were told to go to the Ufficio Assistenza Clienti. More than one hundred grumpy people swarmed into a long room where a slender young woman in a dark green uniform peered at a computer, flipped through some tattered pages and then turned to stare at the blinking PARTENZE screen high on the wall behind her desk. The travelers became more insistent as it became clear that the last train leaving Bologna in any direction was departing in less than forty minutes. She did a heroic job. Soon the Florence-bound passengers were running to catch the night train to Calabria leaving on Track Three. The train to Calabria was an old beat up regional train with broken fixtures, stained seats and the lingering odor of recent meals and long ago tobacco. This was the train that inspired letters to the editor about lice and bedbugs (although the only beds were seats pulled together). Groups of young toughs and tired illegal vendors paced through the corridors from car to car. The few women sought out each other for company for the nightlong haul to the southern tip of Italy. The train was forty minutes late pulling in to Florence and didn’t stop at Stazione Santa Maria Novella in the center of the city, but rather at a small squalid, brightly-lit station on the southern edge of town. Nine and a half hours after leaving Bari even the periphery of Florence looked welcoming and the surly twitchy cab driver with the dirty ancient taxi was a gift. To think of marble is to think of the town of Carrara in the Italian Apuan Alps. But a more interesting place to visit is the nearby village of Colonnata, which also has a heart of stone, un’anima anarchica (a soul of anarchy), and a palate for lardo. It’s best to come on the weekend when the last two miles of the road are blocked and visitors are required to take the CAT bus as the track gets narrower with challenging hair-pin curves. 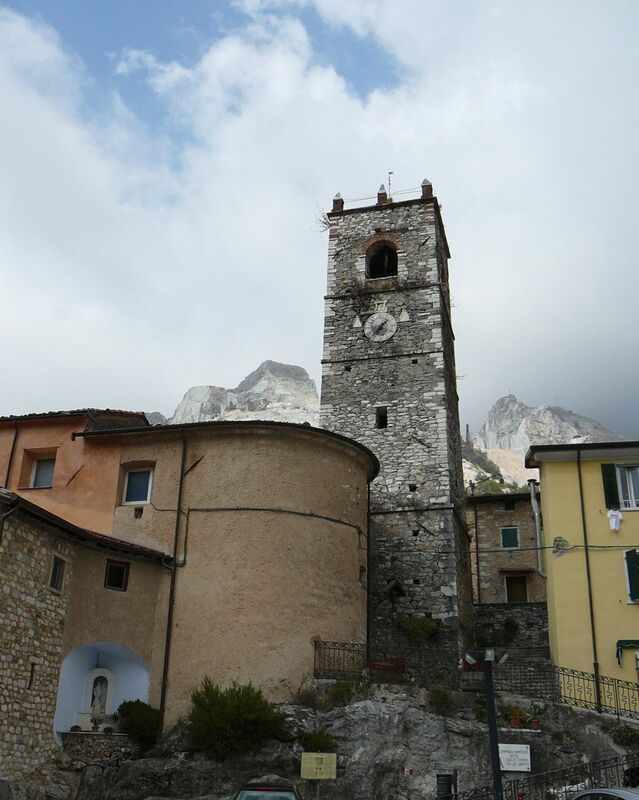 A tower behind which looms the white-slashed cliffs of the marble quarries guards the main village square. At about 1,800 feet above sea level, the air is fresh and crystal clear even at the height of summer. Distant thunder seems to role off the cliffs on the clearest day – the sound echoing from work in the quarries. 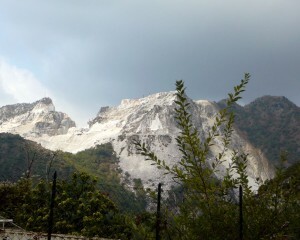 For centuries the mountains were excavated and blocks of enormous size were lowered down the cliffs. Thin veins and dark blue spots distinguish the marble extracted from the quarries of Colonnata. During a flood in the mid-19th century, numerous marble artifacts came to light, in particular an inscription, dating from ancient Rome, inferring the importance of the Colonnata quarries. The name is taken from the Latin Columna. Inhabited by quarrymen, who in the past walked to work in the surrounding quarries, Colonnata is now more famous for the lunch these workers ate. The quarrymen of years past would carry lardo, cured pork fat, cut it into thin slices to then put it between two slices of rustic bread along with pieces of tomatoes. This “sandwich” was prepared early in the morning and was used together with the flask of wine to give the laborers the necessary calories to face the steep slopes and backbreaking excavating. They were often in the quarry for several days without returning home. They needed food that was nourishing, but also did not spoil. In the last century, the cured fatback was called “the food of the anarchists” because people persecuted by local governments were forced to take refuge in the Apuan Mountains and subsisted on lardo. Wandering the walkways of this tiny hamlet there is a lardarium around every corner. 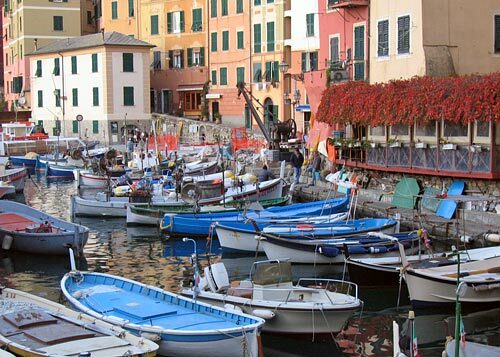 There are now fourteen establishments creating the delicacy that is shipped throughout Italy and beyond. 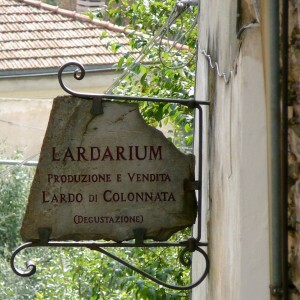 The local trattorias and restaurants specialize in transforming lardo into sweet or savory and hot or cold dishes. Of course, it goes without saying, there are dozens of shops along the road from Carrara and in Colonnata where items made of local stone can be purchased. Take home an elegant mortar and pestle for the kitchen, a decorative ball thinly veined in blue or pink, or a travertine fruit bowl. 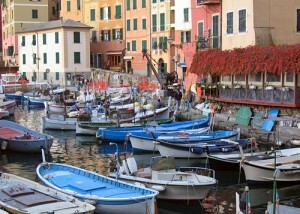 For those who love Italy and can’t wait for their next visit or those who dream of Italy and are planning their first tour, TuscanTraveler.com will be an informative, funny and enjoyable site to visit on a weekly basis. Where is the OLD Tuscan Traveler? 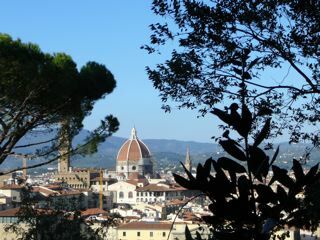 For those looking for the Tuscan Traveler, who conducted special walking tours of Florence and showed people the hidden sights along the back roads of Tuscany, please see a really NEW site called Friend In Florence where custom guided tours and special self-guided tour packets are described and offered. Tuscan Traveler wishes to thank Pauline Kenny for all of her help in the design and launching of the NEW TuscanTraveler.com and Friend in Florence. These two sites would not have been possible without her. Pauline, founder of SlowTrav.com, is currently working on two new websites: Cotswolder, a travel guide for the Cotswolds in England and Slow Europe, a guide to vacation rentals in Europe (launching October 2008). The Florentine Duomo, Santa Maria del Fiore (St. Mary of the Flower) recently celebrated the 712th anniversary of the laying of the first stone on September 8, 1296. The day was marked by the ringing of the bells in Giotto’s campanile, the annual opening of the mid-level terrace to visitors, and the open-house of the La Bottega dell’Opera di Santa Maria del Fiore — the fix-it shop of the cathedral. On Via dello Studio, half a block from Piazza del Duomo, Claudio, a stone-cutter, works with about ten other men to keep the Duomo in repair. 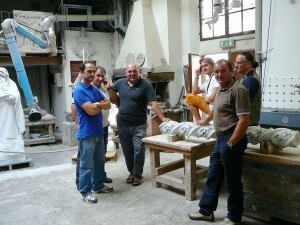 Usually passersby look in through the dusty windows to see a large workshop with machines found in every modern crafts workshop – a milling machine, a circular saw – along with manual tools forged in steel, some a few centuries old – a stonemason’s chisel, gravers, hammers and the same marble drills used by Renaissance artists. On September 8, 2008, visitors could enter and look around. This is the third location of the workshop. During Michelangelo’s time it was located in a courtyard of the building behind the aspe of the Duomo – now the Museo dell’Opera del Duomo. It was in this same courtyard where the David was carved. In the 1700s, the old courtyard was abandoned and the craftsmen were relocated to a rotunda still found in Piazza delle Pallottole – now the Sasso di Dante trattoria. In the mid-1800s, the workshop was moved to its present location. 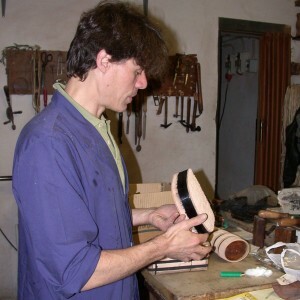 On the cathedral’s birthday, Claudio and his colleagues get the day “off” and invite both Florentines and tourists in to view their craftsmanship up close, to take photographs and to learn about the work done by the botegga. 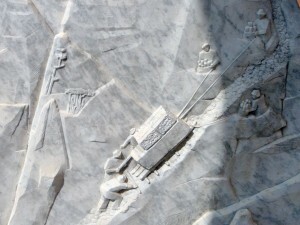 The men point to the parts of the Duomo or the bell tower where they have cleaned, repaired or replaced dirty, damaged or destroyed columns, statues, sections of marble, and pieces of colored glass or gold leaf. One craftsman is currently creating a copy of a six-foot statue of St. Sebastian that sat in a niche to the left of the Madonna on the façade of the cathedral. The original statue was carved in the late 1800s when the façade finally, after 400 years, was erected to hide the gray stone front wall of the church. 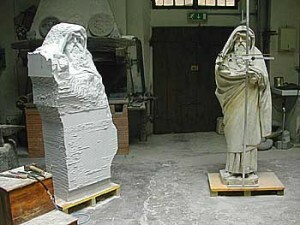 When the copy is complete, the original will join its brethren in the museum of the Duomo and the copy will take its place high on the front of the cathedral. Most of the original statues on the façade of the cathedral and in the niches on the bell tower have been replaced with copies. 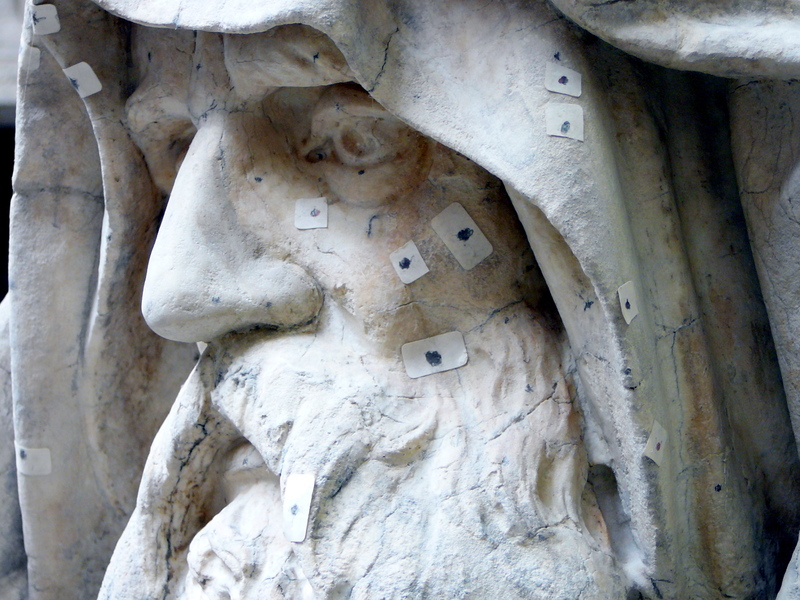 No computer helps the stone-cutter make an exact copy of the statue. The process used to make the copy is the same used by sculptors 500 years ago. 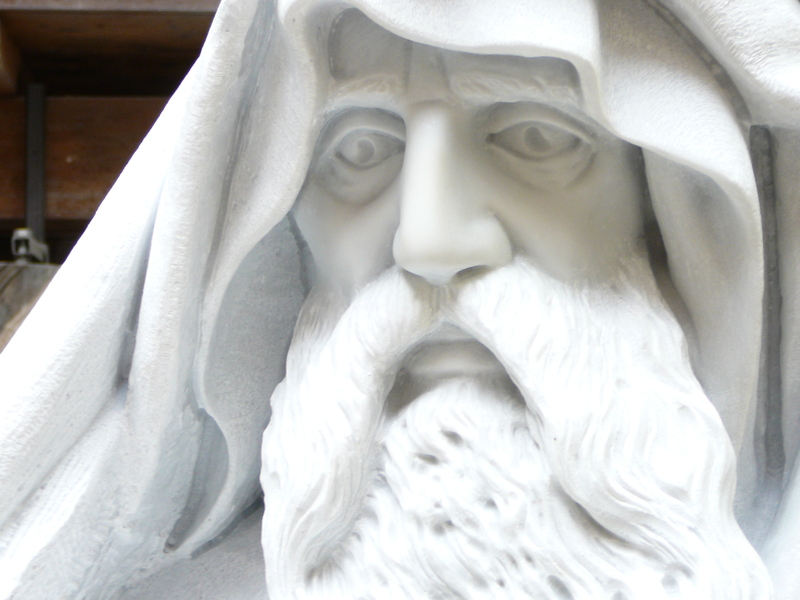 Measurements are taken from the original (be it an existing marble statue or a plaster model) using a freestanding metal device that has an arm with a point that sets the distance of the stone cut and then is turned to transfer the same measurement to the new block of marble. 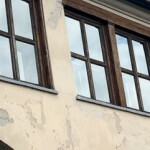 Black dots are put on the original in the areas of finest detail so that the final cuts are accurate. The original rough shaping is done with electric tools, but the final work is done with small tools resembling dental instruments. The bottega workmen are proud that when a pillar, stone or marble decoration or statue is replaced on the Duomo, the identical material is used, requiring the same skills and artistic sense of the original craftsmen. For over half a century in Florence, the name Latini has been associated with classic Tuscan food and wine. Today, the two Latini brothers carry on the proud tradition, but each in his own unique way. Narciso Latini took over his Uncle Angelo’s fiaschetteria (wine bar) in Via della Vigna Nuova almost sixty years ago, a few years after World War II ended. He sold wine made in the Chianti region around Val d’Elsa. 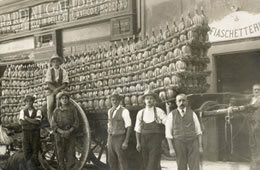 He offered prosciutto, salame, finocchiona, and hardboiled eggs to go with his customers’ glasses of vino rosso. Soon Narciso’s wife, Maria, started preparing ribollita (vegetable bread soup) and pappa al pomodoro (tomato bread soup) to be sold alongside the sliced meats, cheeses and sandwiches. In 1965, Narciso and Maria, now joined by their two sons, Torello and Giovanni, moved the fiaschetteria to a larger space in what had been the stables of the 15th century palazzo of the noble Rucellai family. The Latini family created an informal and jovial trattoria where Maria expanded the menu to include all of the typical Tuscan dishes, including pasta al ragu, ossobuco, and grilled or roasted meats. In the caves and tunnels carved out of the soft tufa stone below Il Latini, Narciso created a cantina to store wine. 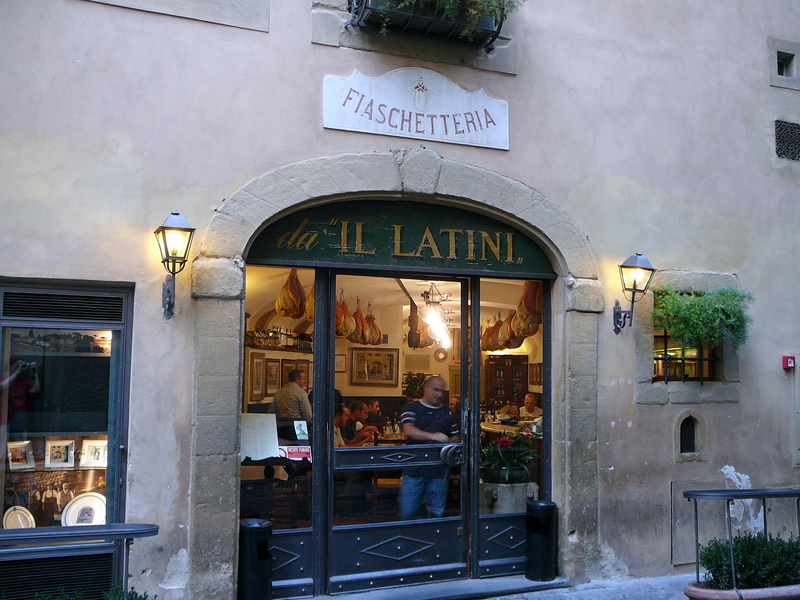 Eighteen months after the opening of the new trattoria, on November 4, 1966, the great flood of the Arno River inundated Il Latini and filled the cantina. The water crested above six feet in that part of Florence. By sheer grit the family worked together to be the first place open to serve hot meals to Florentines, who were clearing the streets and their homes of tons of oily mud. 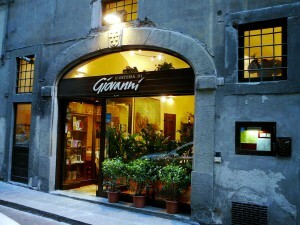 Giovanni says that Il Latini was able to open after three days because of two main reasons. 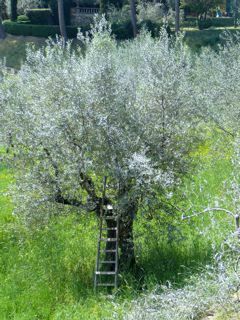 First, the extended family hurried in from the countryside near San Gimignano with water, wine, bread, vegetables, cured meats, olive oil and wood; and then stayed to dig out the trattoria. Second, the stove and oven were wood-burning and once cleaned, they were ready for use. Narciso seated famous politicians, artists and writers with local blue-collar workers. 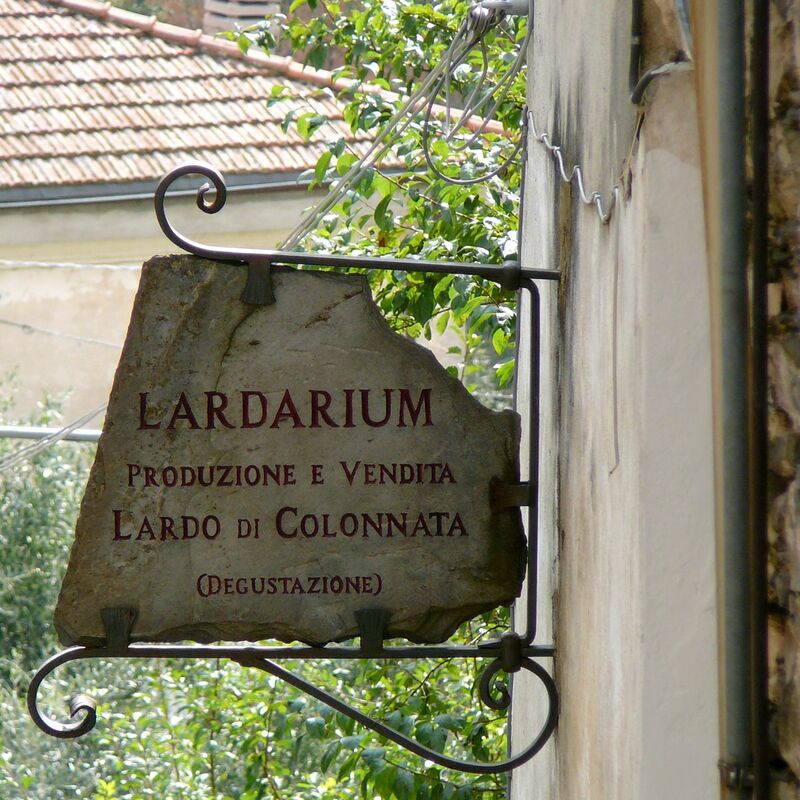 Guests often walk out of the place with a free bottle of Latini-labeled wine in hand. Ecstatic German Prime Minister, Helmut Kohl left with an entire prosciutto under his arm. In 1982, Narciso established The Friends of Latini prize that rewards the work of poets “who have contributed to the greatness of contemporary literature.” The winner is given a whole prosciutto. At the beginning of the new millennium, big changes came to the tight-knit Latini family. Narciso, now a widower, turned ninety and took a less active role in the trattoria. Giovanni, his American wife Carol and their two daughters Chiara and Caterina, decided to try something new. In 2004, they took over the space of the defunct Osteria No. Uno, on Via del Moro, a block away from Il Latini. There L’Osteria di Giovanni was born with Giovanni greeting the guests, Caterina overseeing the kitchen, Chiara creating the innovative wine list and Carol inspiring the desserts. Narciso split his time between both the old trattoria and the new osteria until his death in January 2008 at the age of 96. A characteristic decor, with lots of prosciutti and various types of salame hanging from the ceiling, full wine racks with straw-covered fiaschi and heavy dark wood furniture, greets visitors as they enter the trattoria. For dinner, customers arrive at 7:30pm to get in the crowd massed at the door, for even with a reservations there is a wait as Torello Latini and his waiters skillfully fit parties together at the communal tables. Getting thrown together with strangers and sharing a common meal is part of the fun here. The place is huge so everybody gets seated. Forget gastronomic pretensions and don’t think this is a spot for a quiet, romantic dinner. 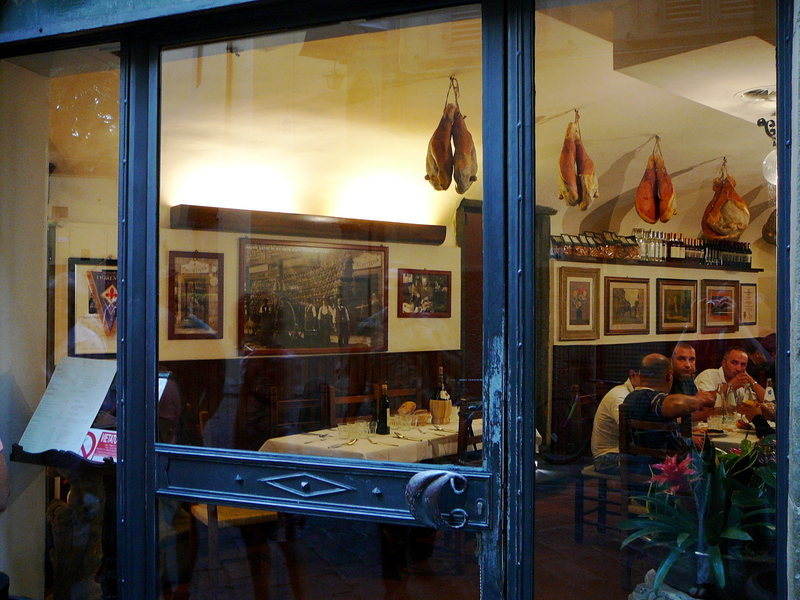 This is the Italian dining experience most foreigners envision and many want to experience. One of the winning factors of the Latini philosophy has been to always use the finest, freshest ingredients and respect the traditions of simple but wholesome Tuscan cooking. It is extremely difficult to get a menu. Torello seems to prefer to serve a filling, traditional set meal with a bottomless carafe of wine. This usually kicks off with ribollita and pappa al pomodoro (Nonna Maria’s specialties) or penne strascicate. If everyone agrees on the arrosto misto, a table-filling platter is delivered heaped high with assorted roast meats. If you have a favorite traditional Tuscan main dish or a favorite bottle of Italian or French wine, yell it out early and they will serve it to you. Usually a table will finish off with a round of cantucci con vin santo for everyone. The bill is inevitably 50 euro per head. Before leaving, be sure to ask to see the cantina, recently redesigned, but still located deep under Il Latini in the caves and tunnels running under the Palazzo Rucellai. Open for lunch and dinner. Closed Monday. 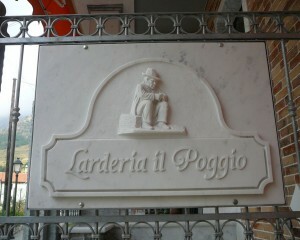 Giovanni and his family have created something completely different from the old family trattoria. 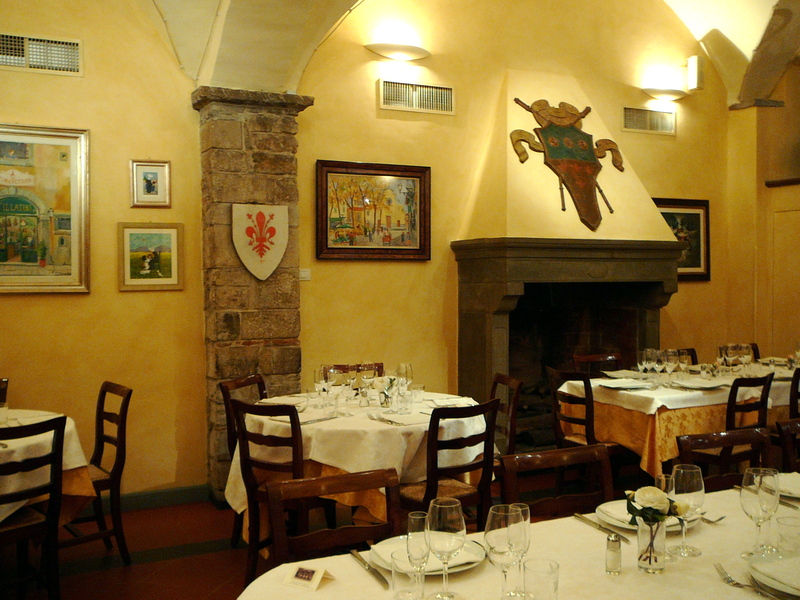 Modern art on the walls, widely spaced tables dressed in fine linen, a sophisticated wine list, and Tuscan cuisine with an up-dated concept make this a restaurant to savor and enjoy. 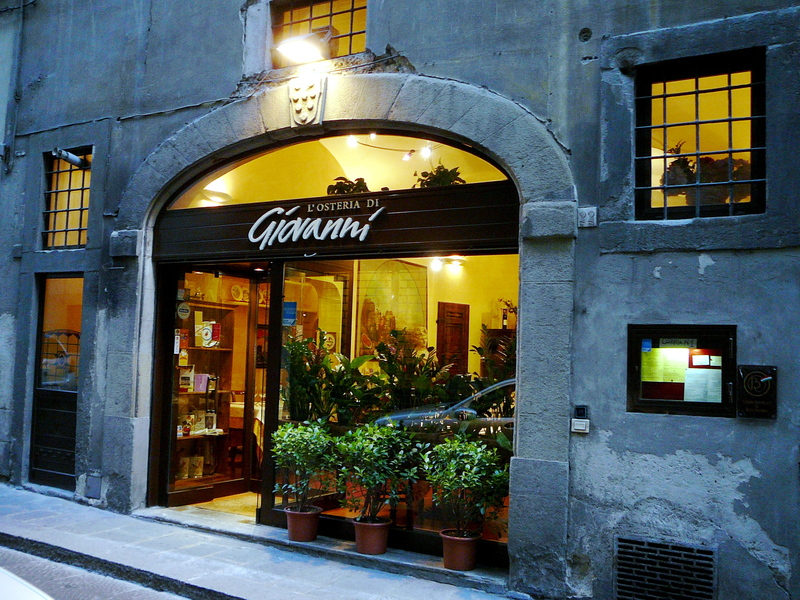 Giovanni is a welcoming host, who serves as many native Florentines as he does visitors from abroad. A plate of tiny mouth-watering warm fried bread coccoli (cuddles) and cold flutes of Prosecco are placed on the table immediately for munching and sipping while perusing the menu where every dish has a helpful description in English or Italian. The Latini clan makes their own wine, which is served as the house wine for both restaurants. Chiara, the sommelier at the Osteria, sought out the small artisan wineries as well as famous makers to fill her wine cellar with almost 600 labels to guarantee a vintage for any palate. The reasonably-priced wine list is detailed and is a joy to read. 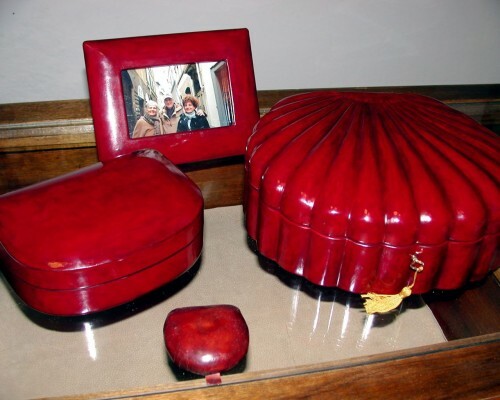 Caterina attended L’Ecole des Arts Culinaires and the French Culinary Institute of New York. Like her grandmother, she insists on the freshest ingredients, but she adds a refined modern interpretation and presentation to the traditional recipes. Popular dishes include salmon cured with pink peppercorns, served with sour cream and melon, tortelli stuffed with pear and pecorino with leek and paprika sauce, pici with sausage and kale, and lamb slow-cooked with artichokes. Although there are a couple of traditional desserts on the ever-changing seasonal menu, Giovanni’s wife Carol has delighted everyone by introducing a warm citrus cake and a light pineapple carpaccio with red peppercorns. Dinner will average 40 to 50 euro per person, depending on the choice of wine. Open for lunch and dinner. Closed Tuesday. Visitors to Florence, Italy, know that to miss the paintings of Botticelli and Caravaggio in the Uffizi Gallery, the Ponte Vecchio with its famous gold merchants, and the gaudy splendors of the Pitti Palace is to miss three of Florence’s best-known sites. The Vasari Corridor is an aerial passageway that connects the Palazzo Vecchio on one side of the River Arno to the Palazzo Pitti on the other. 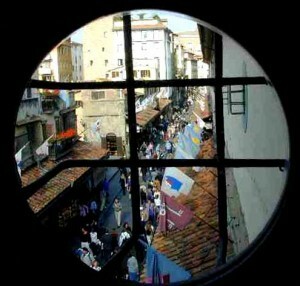 It passes over the roofs of the shops on the Ponte Vecchio, and through galleries, mansions and churches. Traversing over 800 meters (.49 miles), it is the longest single passageway of paintings and portraits in the world. 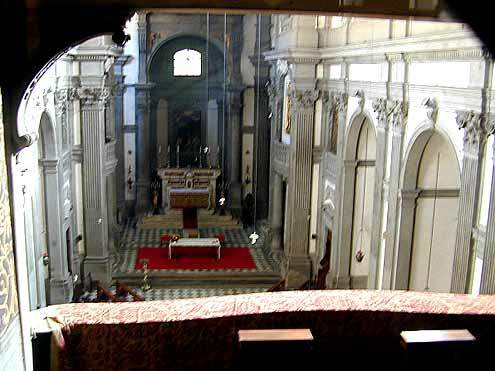 Those who travel in the footsteps of the Florentine Grand Dukes not only see a unique art collection, but also are shown a hidden route with exclusive views and unexpected secret glimpses of the classic Florentine cityscape while walking above the heads of tourists swarming the streets below. 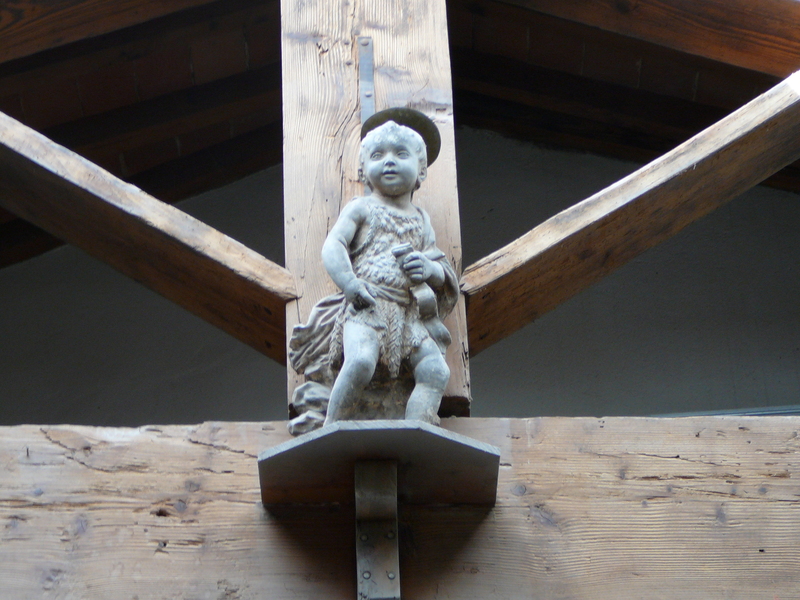 In 2008, there are ongoing discussions about whether the Vasari Corridor will stay open or whether the collection in the Corridor should be taken down and tours discontinued due to security and preservation concerns. The facility is frequently closed for months at a time. The unique construction and length of the Corridor requires that tours must be undertaken in small groups accompanied by authorized tour guides. 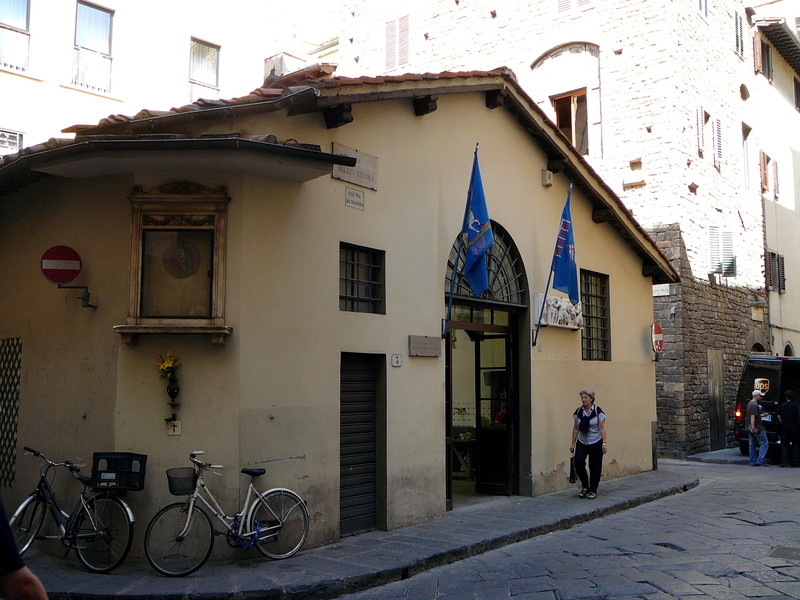 In the 1540’s, Cosimo I, an enlightened despot who ruled Florence and all of Tuscany, lived with his Spanish wife Eleonora di Toledo and their children above the “shop” in the Palazzo Vecchio, the Florence City Hall. Eleonora was in charge of the family finances and disliked living in the Palazzo Vecchio. In 1549, she found the home of her dreams, and so purchased the Palazzo Pitti from the debt-encumbered Pitti family, rivals of the Medici clan. She had the palace remodeled and enlarged. The façade grew to over 670 feet in length, becoming the grandest of the Renaissance palaces and the seat of the Medici dynasty for the next 200 years. 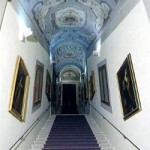 Using the occasion of his son Francesco’s 1565 wedding to Joanna of Austria as an excuse, Cosimo commissioned his architect Giorgio Vasari to design an above-ground walkway from his home to the offices. 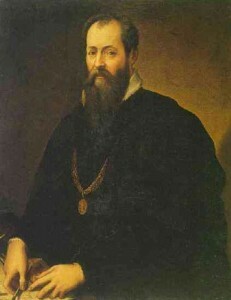 Vasari, a true man of the Renaissance –architect, painter, author and art historian — took only six months to design and direct the building of the Corridor. Cosimo did not own all of the property between the Palazzo Vecchio and the Palazzo Pitti. Vasari thus had to get permission to build the Corridor through other people’s towers, mansions and businesses. When the Mannelli family refused permission for the corridor to pass through their tower, situated at the south end of the Ponte Vecchio, Vasari designed the passageway to be built around, but attached to, la torre dei Mannelli. Cosimo claimed that the architectural wonder was for the amazement of the wedding guests and to remind the citizens of Florence of his power and authority, but he also gained an escape route from either home or office and a way to spy on the Florentines from above many of the busiest thoroughfares. The Corridor was also eventually used as a nursery for many generations of Medici children; and the elderly, infirm and lazy could be wheeled through the corridor in basket chairs. Apparently, however, the stench of the Ponte Vecchio remained a problem because in 1594, Cosimo’s son Fernando decreed that the butchers and tanners would be ousted and replaced by goldsmiths and jewelers. 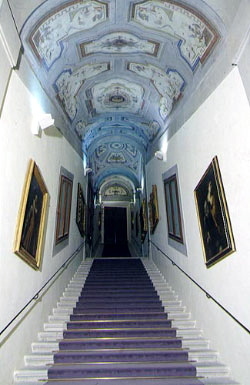 The exit for the Vasari Corridor from the Palazzo Vecchio is from Eleonora’s Green Room, La Camera Verde, in the former Medici family apartments on the second floor. The Green Room is now part of the fascinating Palazzo Vecchio Museum and is usually not included in tours of the Corridor. A short sky bridge passes over Via della Ninna and enters the east wing of the Uffizi Gallery, which holds the largest collection of Italian medieval and Renaissance art in the world. 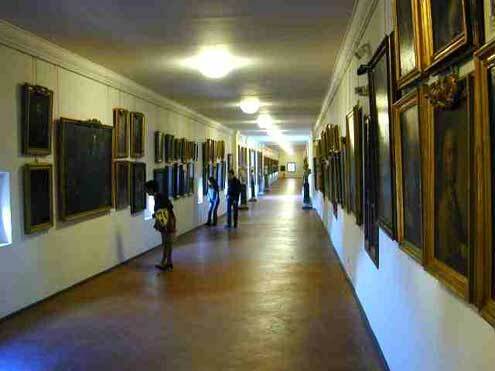 Today, most tours of the Vassari Corridor begin in the Uffizi. Each participant receives instructions on what time and where to meet the tour guide, usually outside the Uffizi ticket office at Door No. Three on the west loggia (porch). The main branch of the Vasari Corridor is entered via a doorway located near the beginning of the west corridor of the Uffizi Gallery. The passage drops down a long stairway flanked by paintings from the Medici collection and then traverses the top of the arcade on the north bank of the Arno. It turns left over the shops on the Ponte Vecchio, and continues on through to the Boboli Gardens of the Palazzo Pitti. Visitors exit into the garden. 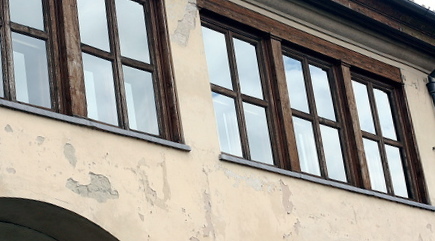 Small windows all along the Corridor provide excellent views of the river and the city. 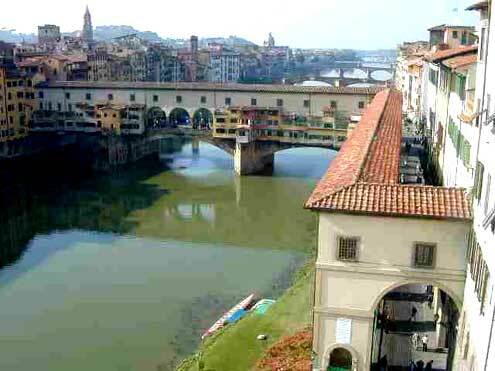 The best view is in the center of the Ponte Vecchio through two large sets of windows that look west down the Arno. These windows were not part on the original design, but were installed at the direction of Mussolini in 1939, reportedly because Hitler and Mussolini wanted to look at the view while they held private meetings in the Corridor. By some reports, Hitler’s fondness for the Corridor and the Ponte Vecchio spared both when the retreating Germans blew up all of the other bridges crossing the Arno as the Allies advanced on Florence in August 1944. Past the church, the tour ends in the Boboli Gardens, next to the elaborate grotto designed by Bountalenti in the 1580s. Designed for Eleonora di Toledo by Niccolo Tribolo in 1550, the garden, with its many acres of walkways, mazes, lakes, views and decorative sculpture, is one of the finest examples of Italianate landscape architecture. The first collection, which starts at the doorway from the Uffizi Gallery and ends as the Corridor turns on to the Ponte Vecchio, is a group of 17th- and 18th-century paintings by Italian and other European artists. Cardinal Leopoldo de’Medici at his death left a collection of 730 paintings, 318 sculptures, 1,245 drawings, 589 small portraits, and thousands of medals and other objet d’arte to his heirs. 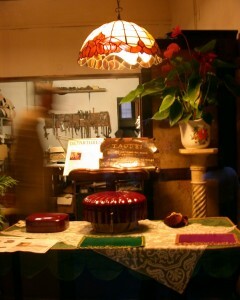 A small portion of his collection is displayed in the Corridor. Notable among the first group of paintings are pieces by Guido Reni, Gerrit van Honthorst, Empoli, and Guercino. Only a portion of the total collection of self-portraits is hung on the Corridor walls at any one time. Those now on display include Giorgio Vasari, Titian, Correggio, Rubens, Rembrandt, Van Dyck, Velasquez, Sir Joshua Reynolds, Antonio Canova, Delacroix, John Singer Sargent, and Carlo Levi. 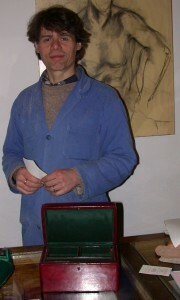 The last displayed, but not the last to reach the Gallery, is a self-portrait donated by Marc Chagall in 1976. A fake Leonardo da Vinci is also displayed: it was part of the Medici collection, but was found by x-ray to be painted over a 17th century Magdalene. The last group of paintings, displayed in the Corridor where it turns toward the Boboli Gardens, is a collection of Medici and Hapsburg/Lorraine family portraits, many of them of the children. These give valuable insight into the attire and mannerisms of wealthy 17th and 18th century nobility. Touring the Vassari Corridor has become relatively expensive in the past five years because the Uffizi Gallery privatized the service. Tours cost 65 euro to 110 euro depending on the tour provider. Tours are given in English. Reservations should be made well in advance.